I know, I know. The map trend has already made a few laps around the proverbial block, but all of the sudden it seems urgent to know where Georgia is in proximity to Russia, to know with certainty that Iraq and Pakistan DO NOT share a border, and to be able to draw a giant geopolitical flow chart that shows the connections among all of the countries currently fueling the global economy (hint: America is not one of them). So, for those of us who cannot see Russia from our back porches, I present a day of international geography as viewed from a domestic perspective. Hopefully we'll all learn something, myself included. 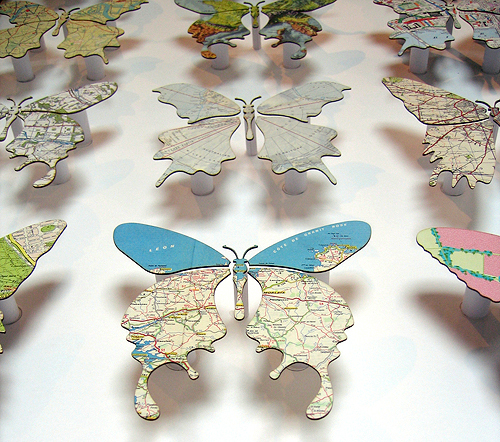 Because I may or may not be able to identify all 50 states in their correct positions. Although I do know where Alaska is. 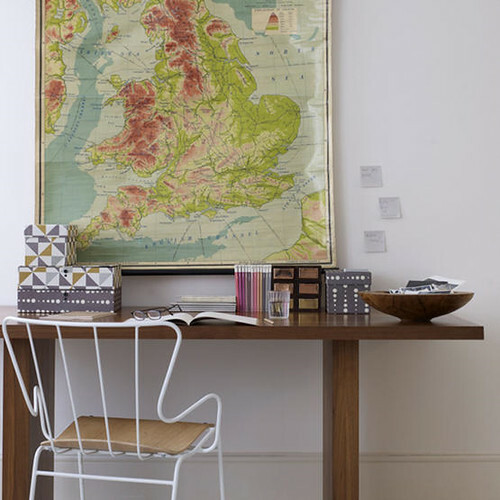 First up, this gorgeous map from the desk of At Home At Home. I'm pretty sure I have no idea what landmass is depicted there. I could cheat and look it up, but... that would be cheating. For now I shall bask in my ignorance until someone enlightens me. Anyone? Anyone? Buelllllllerr? 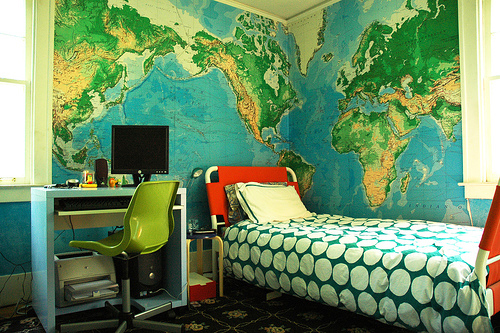 Perhaps if I slept in this room decorated by Flickr user kbreebo, I would already know with certainty that the unidentified landmass is _____ ? Well, at least her lucky son will grow up with the kind of intellectual acumen that I might also have acquired if only I hadn't slept through geography class. Although geography class in a Texas public school consists largely of identifying Texas on a map. Well, and maybe Arkansas, because you must be able to pinpoint with laserlike accuracy the position of your true mortal enemy. Look! It's Algeria, Libya, Egypt, Mali, Niger, Chad, Saudi Arabia, Yemen, Turkey, Iraq, and Iran (you know, the "I" country that DOES share a border with Pakistan). 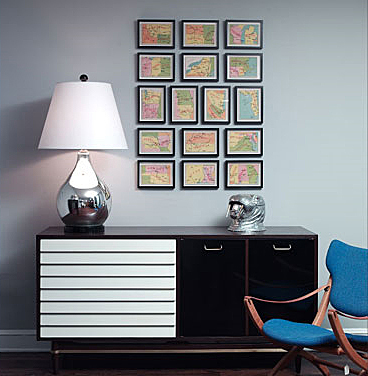 It's probably a miracle that I can even read (I'm talking to you, Texas High School), but these digitally printed map tiles seen on Remodelista have nice, big print. Squiggles and colors and dots, oh my! I can't identify a single thing here. Ok... I am identifying some lust. 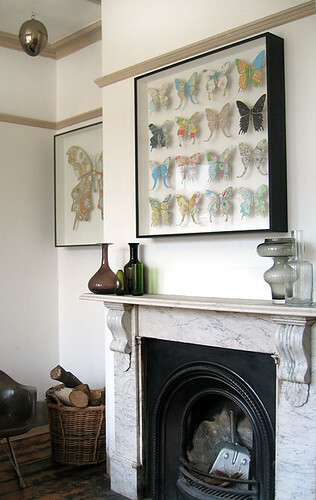 I want a swarm of these gorgeous specimens to fill The Hole behind my couch, and maybe I could put a magnifying glass and atlas below the frame in the vain hope that I could (or would even bother to) edumacate myself. Oh beauty, thou art a gloriously distracting trollop. This amazing vignette by Steven Sclaroff poses a similar set of problems, chief among them the incontiguous arrangement of map parts. How am I supposed to track the Bridge to Nowhere when nothing is linear??? 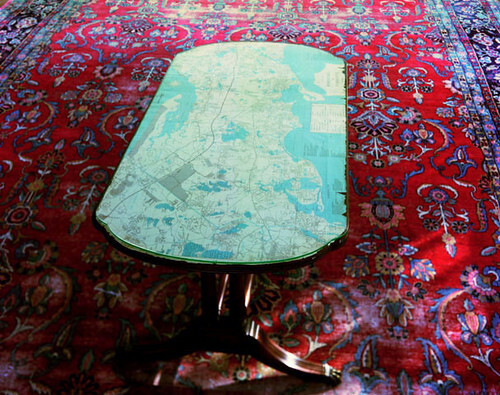 I suppose I could make my own map table, like this one photographed by Caroline Burghardt. That way I could just hunker down with my studies and let my tush be cushioned by a fabulous Persian rug. Now where was Iran again...? Or I could park my tush elsewhere and sit for a spell. 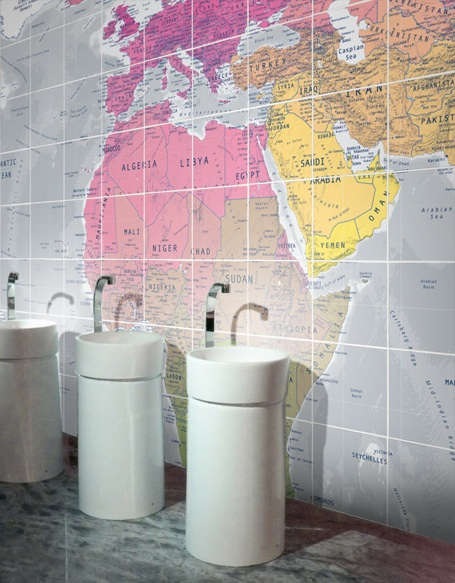 It's probably pretty important that I know where Saudi Arabia is, and after I finish with business, I can plan with pleasure my trip to South Africa where I shall visit the fabulous Heather at Elle Decor SA. Thanks, Apartment Therapy! 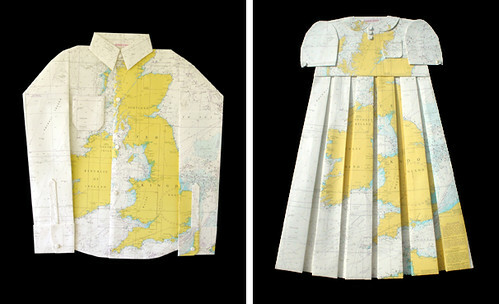 The images in these paper clothes meticulously crafted from maps by Elisabeth LECOURT look suspiciously like the UK. Now, my geographic knowledge is probably up to average for the average American student, but I can't settle for mere mediocrity. 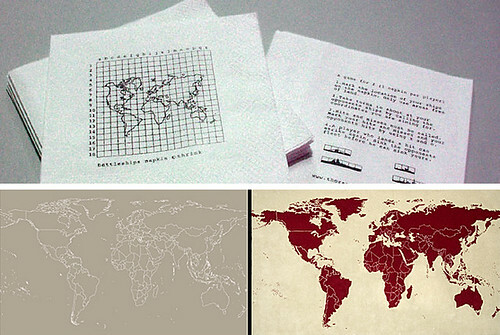 Battleship napkins and badass world map RUGS from Thorsten van Elten will ensure that I continue to broaden my cartographic repertoire. Soon, I'll be able to recite all 7 continents. That is, if we don't continue to confuse Sunni with Shia, ignite WWIII and get bombed back to Pangea first. I'll just pretend (for now) that won't happen, and in the meantime I'll use these placemats to work my way towards a more detailed knowledge of our world's highways and byways. Who am I kidding? I don't even think I could catch a bus to 6th street in Austin. I once spent three hours riding the bus around Hawaii because I couldn't figure out where to get off. The driver finally kicked me off at the end of his shift when we arrived at the central bus terminal, which was nowhere even remotely close to my destination. Did I mention that my sense of direction is ridiculously, unfathomably bad? I can't let my inherent lack of aptitude get me down, though. 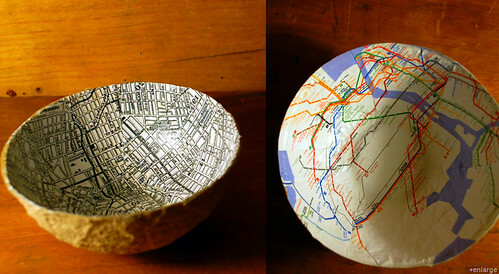 I'll keep my nose to the grindstone and my eyes on the prize with these recycled map bowls by Liz Grotyohann. 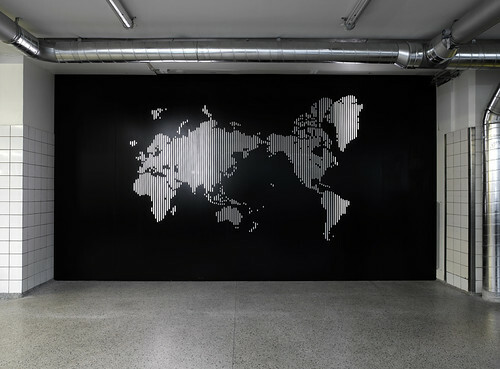 And with this nifty wall sized world map clock by Johannes Wohnseifer, I'll be able to see that while night falls and study time is over for me, the sun also rises on the opposite of the world for others, like Miss Raina over in New Zealand. Here's to hoping that the children of tomorrow will be better studies of the world than I was yesterday. 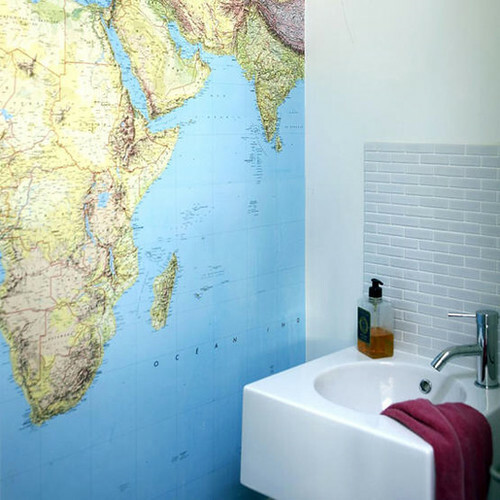 Although today I have learned that I may want a giant map for The Hole on my wall, and that's something.